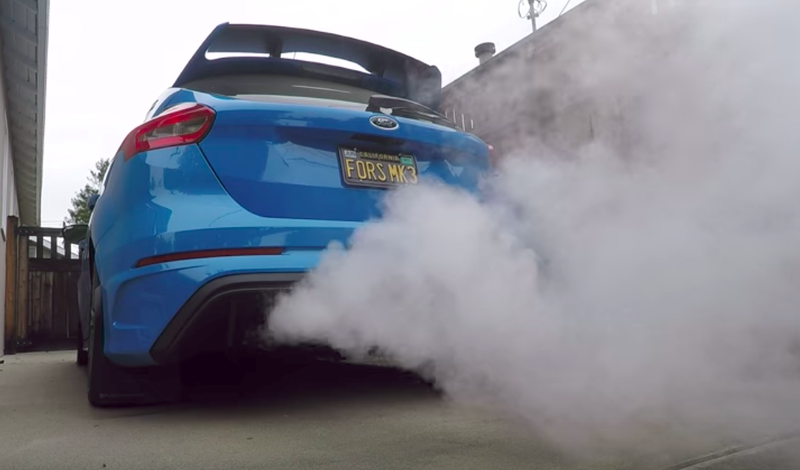 Dozens of Focus RS owners around the world say they have been experiencing misfires, loss of cabin heat and/or plumes of white smoke spewing from their exhaust pipes. The culprit: failed head gaskets. And it’s been causing a huge stir in the Focus RS community. I started digging and here’s what I found. This is, unfortunately for owners, as much a global problem as the Focus RS is a global car. The German forum Focus RS Forum, for example, includes a 130 page discussion titled “Thema Kühlmittelverlust” (Topic Coolant Loss), a discussion in which someone by the screen name of mcloud0102 wrote this about what they claimed was already their second engine (there’s no mention of what happened to the first one). No track usage, no race and driftmode used. Oil change after running in, warm and cooling trips respected. Well, coolant loss, exhaust gas diagnosis in the coolant. They mentioned in a subsequent post that about 200 milliliters (about a cup of coffee worth) of coolant was missing at around 18,900 kilometers, that interior heating and cold start performance deteriorated, and that the engine ran on only three cylinders until the gas was pressed, at which point, the fourth cylinder came on board. Anyway, after a puff of smoke and an empty coolant tank I took the [car] into Ford and they confirmed coolant in cylinder 3. Not sure whether it’ll be new HG or whole new engine but either way, it’s not been modded out of warranty so trying to remain philosophical! I have had several messages from owners who feel it would be beneficial to collate data from owners with engine issues and gather signatures to force Ford into some kind of recall/fix for the ongoing engine issues. Its tricky as will highlight the issue to potential owners and I see it being a struggle to get Ford to do anything but it may be worth a shot. Symptoms/when did you notice issue? : I lost heating, it was because of low coolant level (about 3L lost), engine temperature went up to 2/3 of the scale. I send it to the dealer. They checked if it’s leaking, filled it up with coolant and let me go. After another fuel tank of light driving I lost another 2L of coolant. There were other symptoms too, rough start when cold, sweet smell from the exhaust, check engine light went on and then off. I don’t know if this is related but it happened shortly after the PCM update. Dealer action to resolve: they’re still deciding whether to replace the engine or just the head. I spoke with one of the FocusRS.org members who posted in that thread. He’s a 2016 Focus RS owner named Brett, who started this huge Reddit thread (it currently has nearly 1,000 comments) about his experience with his failed head gasket. Brett told me that, in late August, he noticed a rough start at idle, and a check engine light on the cluster of his 21,000 mile sports hatchback. So he dropped by Advance Auto Parts and the store’s OBD reader indicated “random multiple misfires.” Brett called roadside assistance to have the car towed to the nearest Ford dealer. Six weeks, and they probably haven’t touched the head gasket yet. Probably hasn’t moved if I had to guess...I think the most disappointing thing is having made my second car payment I haven’t driven in six weeks now. Brett told me that head gasket failure between cylinders two and three wasn’t uncommon based on what he saw on forums, and that a number of people indicated that they received entire new engines under warranty. Brett told me that, after reading about other owners’ engine failures, he thinks the problem “is obviously a design flaw.” He’s one of many on car forums with this suspicion. On Nov. 2, after about ten weeks of waiting, the dealership in Roanoke, Virginia finally fixed Brett’s Focus RS, and though it didn’t get a completely new engine like others reportedly did, it did receive a new head gasket and also a completely new cylinder head, allegedly per a request from someone higher up at Ford (Brett said the dealer wasn’t sure why, as the head seemed fine). The good news is that the car seems to be running well now, and Brett was compensated “appropriately” by Ford for the wait. We are aware of the complaints and we are investigating the matter. The video’s description mentions the error codes set off by the apparent failure, including “P0302 - Cylinder #2 Misfire detected” and “P0316 - Misfire Detected on Startup (First 1000 Revolutions).” These are similar codes that others on forums have reported. Despite having read posts and watched videos from a number of owners claiming to have had head gasket problems, I can’t really say how widespread this issue is. I’ve seen a number of people on the internet throw out figures for what percentage of all Ford Focus RS owners have reported head gasket failures, but I haven’t come across any numbers that I trust. And even if there were some accurate failure statistics out there, I don’t have failure rates for other vehicles in the segment, so I wouldn’t have much to compare to. (Consumer Reports does list the Focus as one of the least reliable cars, but the study appears to include all Focus variants). It’s also worth mentioning that owners of enthusiast’s cars tend to be the more vocal than any other owner groups. The number of emails I have received over the years from sports car buyers claiming to have bought a car with a design flaw is staggering. The document includes 43 forum members who have confirmed head gasket failures, and it also contains descriptions of the cars’ symptoms, their dealers’ diagnoses, and the outcomes/resolutions. A similar tally exists on the German Focus RS Forum in a post titled “Anzahl Motorschäden hier im Forum,” (Number of motor failures here on the forum). The most updated post (shown above translated to English) is on page 15, and includes 48 people who have allegedly had issues with their Ford Focus RS engines; the vast majority of the issue descriptions—as you can see in the image above—mention coolant loss. That image above is an inside look at the Focus RS’s 2.3-liter EcoBoost inline-four, essentially a more powerful version of the 2.3-liter turbo that’s been in the Ford Mustang since the 2015 model year. A number of folks suspect that it’s this change in the cylinder head that may be contributing to the RS’s head gasket issues, whereas the Mustang seems to have been thus far unaffected. Among these folks is a guy named Alex, an engineer at British Columbia-based tuning company Stratified, and also the original poster of that enormous thread on FocusRS.org. Last month, he took a deep dive into what he thinks might be causing the head gasket failures, writing a now widely-circulated blog post titled “Focus RS Head Gasket Failure Mechanism,” in which he actually shows what a failed gasket looks like (shown below). There is a very high wear rate of the elastomer (black section) between the cylinders. This is where the gasket has failed. You can see that it is almost completely missing in these areas. Notice how thin the sealing area is between the cylinder overall. Thermal deformation. As the engine is brought through a range of temperatures (within normal operation), the expansion and contraction of the head and block cause this lateral movement between the two interfaces. The movement caused by this is however low cycle, as the engine is warmed up and cooled down relatively few times compared to the next mechanism. What Alex is talking about when he says “open deck” is a design in which the tops of the cylinder sleeves are not supported by the engine’s deck. Notice how there’s open space all the way around the tops of the cylinders. While many like this setup for cooling efficiency and ease of manufacturing, it’s not as popular among tuners, who fear that too much boost can cause the cylinders to deform under high loads. (By contrast, here’s what a Toyota 2JZ-GTE’s closed-deck setup looks like). Alex told me over the phone that there’s nothing inherently wrong with an open-deck design; plenty of engines with open decks seal up just fine, but he does think the setup “contributes to vibration and shifts in the cylinders” in the Focus RS. The result of such shifts, he writes in his blog post, is “material loss from the head gasket, block, or head,” and with time, this can cause the head gasket—the interface between the block and head—to falter. Alex cites an SAE paper titled “Cylinder Head Gasket Fretting/Scrub Mechanism Investigation and Analysis Procedure Developments,” (a paper that just happens to be affiliated with Ford Motor Company) showing what appear to be Computer Assisted Engineering images of strain, load and wear on an engine deck. Once again, the head shows that coolant was found in the area between the cylinders but this was a closed path. Overall the cylinder sealing area was very narrow and the head gasket failed after a number of miles. Alex admitted over the phone that, while his article doesn’t provide any conclusive information on the root cause of the failures, it does at least indicate where the wear points are. A note on the second bullet point: Alex says the original gasket had a narrow opening in the elastomer between the cylinders—this is no longer present, as elastomer now covers the entire area. Alex told me: “The most recent fix is that people are getting heads and gaskets, not just gaskets,” a comment I’ve heard echoed across forums, and over the phone from Brett, the Redditer whose RS was in the shop in Roanoke for 10 weeks. Alex—who wanted me to make clear that he’s a huge fan of what Ford has done with the RS (he considers it an excellent vehicle)—says he’s hearing about 2017 model-year RSs failing, so whatever is going on doesn’t appear to only apply to early models. He told me that somewhere between five to 10 percent of his approximately 100 Focus RS customers have reported having had a head gasket problem. Alex isn’t the only one to have done his own investigating into the head gasket issue. FocusRS.org forum member Regulated used a Vividi VA-400 borescope to film the inside their engine, particularly the interface between the head and block. The videos above and below are what he or she found. Clearly, there are lots of theories out there on why Ford Focus RS head gaskets are failing, and while none seem to be conclusive, there seems to be enough commotion from Focus RS owners around the world for this issue to warrant attention. It’s important to acknowledge that we still don’t really know exactly how many Focus RSs have been affected by these apparent head gasket issues. But the outcry from owners all around the world makes it hard not to wonder if God In Hatchback Form really does suffer from a design flaw. From here, ideally, Ford will officially identify the scale of the issue and come up with a plan to rectify it. Until then, we’ll have our eyes and ears open for updates on the situation. If you have a Focus RS and have had any issues like what you’re reading about here, drop us a line at tips@jalopnik.com.